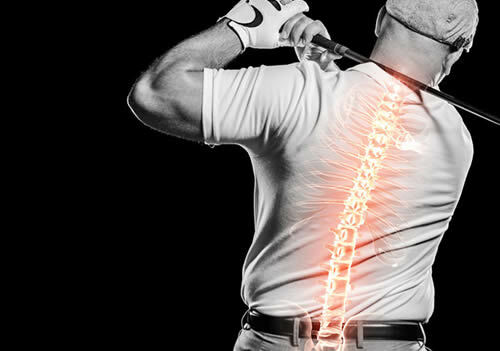 Today’s powerful golf swing styles have enabled both amateurs and professionals to hit the ball harder and farther than in the past, but it may come at the cost of an increase in spine injuries and disorders. Modern golf swings encourage maximum rotation of the spine relative to the hips. This increased twisting of the lumbar spine, combined with a more powerful downswing, puts increased force on spinal discs and facet joints and tremendous pressure on the trailing side of the spine. While more research is needed the article suggests that, in addition to professional medical treatment, golfers with back pain, but without disc herniation or other conditions, should consider including core strength and flexibility training in their therapeutic regimen. The information provided on this website should not be used to diagnose or treat any medical condition and is not meant to take the place of professional medical advice. If you think you have a medical problem, please seek the advice of a physician. Call 911 for all medical emergencies.